Cartography was a complex and shifting science in the 16th and early 17th centuries, because as new lands were being explored, new maps had to keep-up-to-date. For everyday usage, people could purchase printed maps on single sheets of paper. For serious geographers, collections of maps could be purchased which ranged from individual counties to countries. 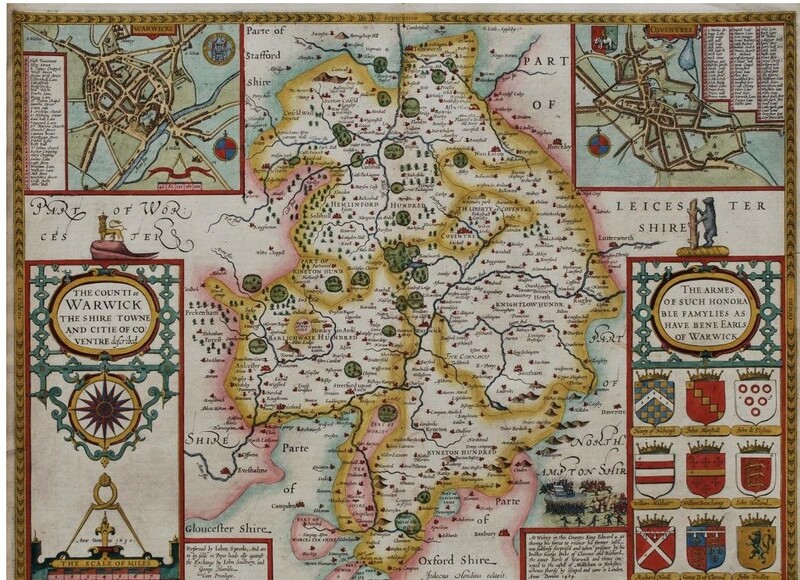 The map of Warwickshire on display was produced by John Speed, and published in a collection called Theatre of the Empire of Great Britaine. Kings, noblemen, politicians and soldiers are amongst Shakespeare’s map-wielding characters. Consulting maps allows for battle decisions, the division of kingdoms, and journey planning. Warwickshire itself is mentioned by Falstaff in Henry IV, Part I as he meets Prince Hal on the way to the battle at Shrewsbury with his troops. Falstaff and his company march from London to the Midlands, through Sutton Coldfield, to get to Shropshire. Can you trace their journey on the map? (Henry IV, Part I, (Act 4, Scene 2). This entry was posted in 2013 Exhibition. I love the Speed map. It’s definitely my favourite object on display! I especially love locating my home town on the map!